Often it seems the unsung heroes of cabinet locking are the rods and rod guides which actuate the locking mechanism to ensure multi-point closure and gasket pull down – these are the components which ensure closure and sealing of large cabinet doors, and which connect to the lock and facilitate secure access control. Here at FDB Panel Fittings we have a wide stock of standard round rod styles and lengths in stock – available from our Online store – which are compatible with our Swinghandles and quarter turn latch locks. 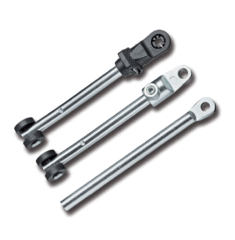 We also have stainless steel round and flat rods for where that added robustness or corrosion resistance is required. Share the post "Multi-point cabinet locking"